MC-223 personal alarm combined with our light weight no-sleep driver attachment (no doze accessory). Driver Alert monitors the head angle and sounds the loud 120dB alarm to prevent drivers from falling asleep. Ideal safety product for people in danger of falling asleep behind the wheel, including truckers, delivery drivers, night shift workers and occasional long distance drivers. Comfortable ear piece warns tired drivers when it senses them nodding. Our driver accessory is powered by the safety alarm so there are no bulky batteries to weigh on your ear. 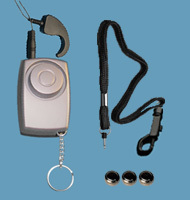 Includes wrist strap and pin to use your personal safety alarm when away from the car. Driving while sleepy is a risky behavior that leads to thousands of automobile crashes each year. The National Highway Traffic Safety Administration estimates that each year drowsy driving results in 1,550 deaths and 71,000 injuries with 55% of these crashes involving drivers 25 years old and younger. - Young males (ages 16 to 29). - Shift workers working at night, anyone working long or irregular hours. - People with untreated sleep apnea syndrome (SAS) and narcolepsy. Fatigue impairs driver reaction time, care and attention, thought processing and short-term memory. At one moment you're aware of feeling drowsy and in a split second you can be asleep -- an incredibly dangerous situation. Common "stay awake" behaviors, such as exercising, turning on the radio, or opening the windows, have not been shown to prevent sleep attacks. Drowsiness ultimately leads to the inability to resist falling asleep at the wheel. Although an effective alerting device may prevent a crash, any driver who falls asleep once is likely to fall asleep again. Sleepy drivers, must view any wake-up alert as an indication of impairment; a signal to stop driving (e.g., change drivers, get a motel or find a rest stop) and get adequate sleep before driving again. This report presents the results of a literature review and opinions of the NHTSA Expert Panel on Driver Fatigue and Sleepiness regarding key issues involved in the problem.